Q Farms chickens are humanely and sustainably raised from their first day of life. They are raised without the use of antibiotics, housed in their brooders until 4 weeks old and rotated daily on outdoor pastures after leaving the brooders. 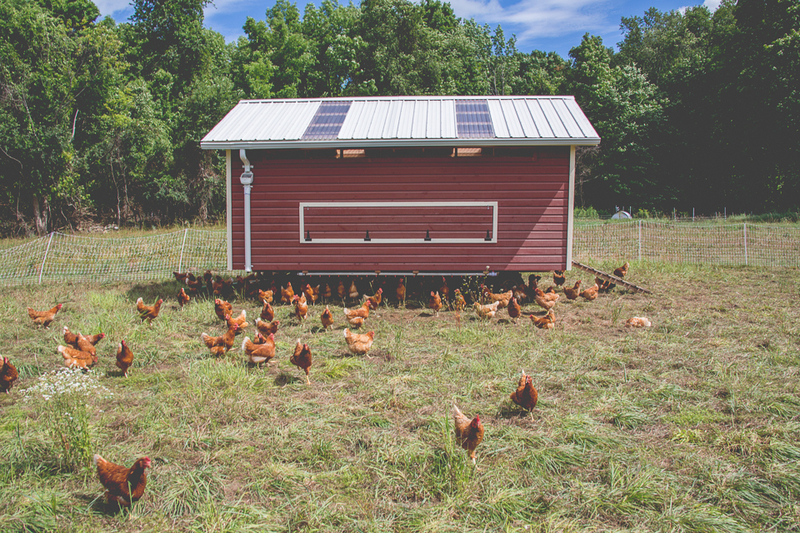 During daily rotation on pasture, chickens live safely from predators in moveable tractors with continuous access to non-GMO grain and fresh water which supplements the pasture and insects that they are designed to eat. Our meat birds, Freedom Rangers, are slow-growing birds derived from an American and European heritage breed that was developed in the early 1960's to meet the high standards of the French Label Rouge program for which pasture-raised poultry is the leading product. The Label Rouge program emphasizes quality attributes such as taste, food safety, and free-range production practices. The main reason for the superior taste of Freedom Rangers lies in the fact they are slower-growing birds bred for pasture. Q Farms pastured chickens are processed, air chilled, and packaged after approximately 9-10 weeks at a local USDA certified poultry facility. Our laying hens are Rhode Island Red crossed with White Rock. Their mobile egg mobile is rotated on pasture daily and hens are free to roam on pasture from sunrise to dusk. We sell our pastured chicken and eggs in our on-farm store. Our chicks arrive at 1 day old, and are incubated in our custom brooders. Our broilers move onto grass at 4 weeks. Our tractors are specially designed to be lightweight and sturdy, so we can move them by hand. Our laying hens spend their lives in the egg mobile, which moves all around our farm.